I finally finished the castle! 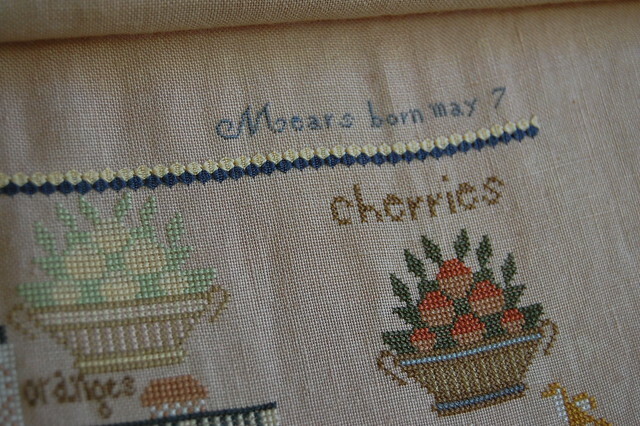 After I finished the bottom half, I put the sampler on a scroll frame in order to do the specialty stitches a little easier. The queen stitch band seemed to take forever. Mainly because I had to rip out parts of it twice and it still isn't quite right (it's up a stitch), but I wasn't going to take out again. Elizabeth looks absolutely wonderful Nicole. It looks so much prettier than I ever imagined it would from looking at the chart. Sorry about the frogging on the Queen stitch - those aren't the easiest stitches to do and then to have to rip them out gives me the woolies! I certainly wouldn't even think of taking them out again only being off a stitch - no one will ever know. She is going to be a beauty! Truly a work of art, Nicola!!! I'd be admiring it, too!! This is really beautiful! !I am drooling :-)! There is no word for Elizabeth but gorgeous! Sorry you had so much trouble with the Queen Stitch band but it's so worth it. Also your framing on SEB is just perfect! Ack! Ok. Maybe I need to order the silks for this. lol! But I'm supposed to be good. Hmmmmm. Your Elizabeth is just breathtaking, Nicole! Queen stitch border problem or no. Gorgeous! Elizabeth is so pretty!!!! Bummer on having to frog :-(. Loving the colors on this! I think the queen's stitches look great. No one will know the difference. Oh my gosh - it's so majestic looking! Your Elizabeth is beautiful, very inspiring. Nicole, your Elizabeth is simply beautiful! Everything about her is lovely! 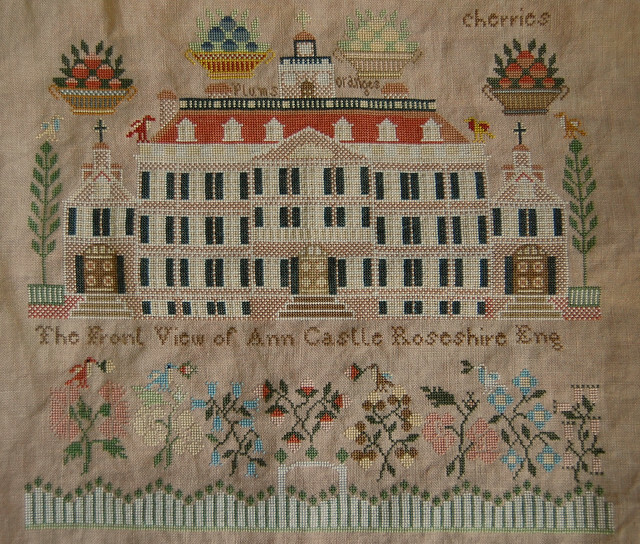 Your stitching is perfect...and that castle! Can't wait to see her finished. Elizabeth looks fabulous. Even though the queen stitch band gave you fits... it's gorgeous. Beautiful progress on Elizabeth! Very inspiring! Everything is bee-utiful! I love the great white house, reminds me of all those Georgian novels I love to read that have descriptions of grand old house. This is going to be spectacular when you finish it! It is looking lovely Nicola! Wouldn't have guessed that the queen stitch was out a row :) Looks perfect just where it is! This is really lovely - great progress! Congrats on completing the castle. That's quite a milestone. Sorry to hear about the trouble you're having with the Queen stitch. It does look great though. So beautiful, Nicole! I'd want it placed where I could admire it, too. Sort of an enticement - see what comes at the end of the stitching ;-). WOW, Elizabeth is looking spectacular. Elizabeth is looking fabulous!! I love the texture the queen stitch provides. It's all just beautiful! It is beautiful, Nicole! The queen stitches look wonderful even if you had to stitch them more than once! 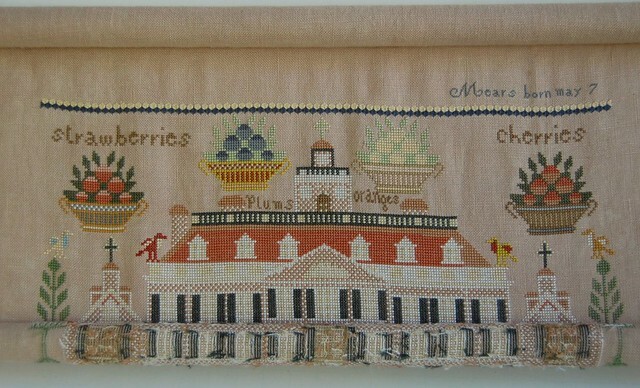 Gorgeous sampler. Great looking queens! 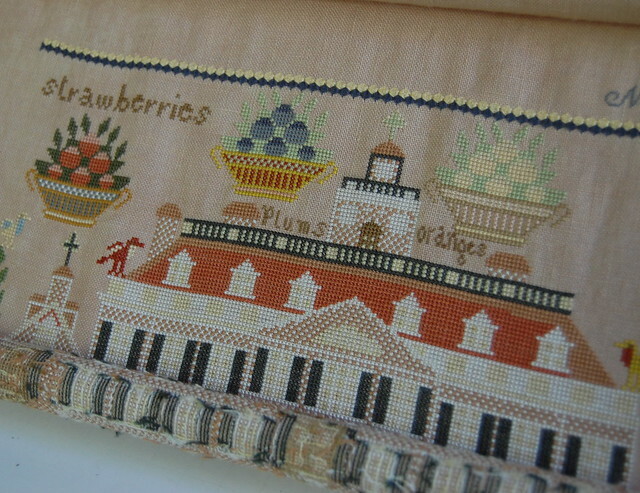 What beautiful work...my list of samplers I'd like to do just keeps growing! I am really liking the colours on this sampler - beautiful! This is so pretty Nicole and I just love the berries and cherry baskets!! Nicole, Elizabeth is absolutely gorgeous!!! Can't believe how much you have accomplished. I love the way Pureness stitches look, but they sure are pokey! Wow! What a beautiful work! This is a stunning project! Beautiful progress on Elizabeth Mears! That queen stitch band looks fabulous, but I'm not looking forward to it when I get there, probably one of my least favorite stitches to stitch.